I had the pleasure of attending a “Winter Walking” seminar hosted by Marathon Sports at their Cambridge location. This seminar was free and open to the public. I’m writing this in order to share the information I learned and to spread the love for local businesses – especially the running stores that keep us all on our feet. No compensation was requested or offered in exchange for this post, although I did use the 20% off discount they provided that night to those of us in attendance. Links to Amazon and other websites are provided only because Marathon’s online shop doesn’t carry all of the gear available in their store. Use these links as illustrative – and if you can buy from your local running shop, that’s my recommended way to go. Success in walking for distance and health depends greatly on eating properly, staying hydrated, being motivated, and using the right gear. Each person’s physique is different, and physical needs vary–especially when it comes to temperature regulation, so understanding your own body and needs is critical for getting the most out of every walk. While a mosey around the neighborhood may not require much advance planning or forethought, going for distances (like the 7-9mi training walks that I prefer, or the 26.2mi that I walk every September for The Jimmy Fund) really requires preparation and training. This series of posts is going to focus specifically on winter walking gear from the waist DOWN. Part two focuses on gear from the waist UP, as well as accessories. 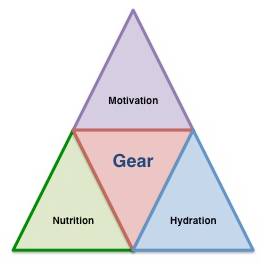 To learn more about what to do for gear in warmer times, check out the posts I wrote about gear for walking marathons (from my first marathon) or about how I geared up for my second walking marathon. The third post in this series is about how to save money on this kind of gear. Shoes: It’s vital to have good-fitting shoes. I love running stores like Marathon Sports because they analyze your gait (how you walk) in order to help find the right shoe for you. Many, if not all, of their store staff are runners, and they understand the importance of a well-fitting shoe. The shoes I’m currently sporting are the Brooks Addiction 11 (in Men’s EEEE, to handle my ridiculously wide feet). Before Marathon fitted me for Brooks shoes, I was only looking at women’s shoes, none of which were wide enough (and I got the injuries to prove that). So – really – think FIT, not fashion. 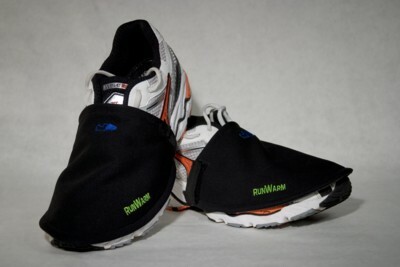 In wintertime, cold and moisture can get into the shoe through the ventilation built into the top of most running shoes. You can solve this transient problem by buying shoes with GORE-TEX uppers, but the recommendation from the folks at Marathon was do something more versatile: layer with your feet. Instead of having different sneakers for different seasons, they recommended that you get a shoe that works for you and then apply a ShoeGlove in order to keep out the wind and rain. I tried these out on a walk in 5ºF (+ wind!) and I have to say: these suckers work miracles. Consider also the use of another shoe add-on, like Yaktrax , to give you extra traction when there is ice or snow out on the path. 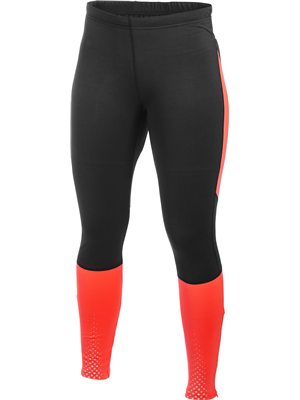 Pants: Tight-fitting leggings or tights, preferably with an ankle grip, can help keep out the wind and moisture, and some come with wind-blocking panels or fleece linings built in. Synthetic materials also wick away moisture, helping to keep you drier. After the seminar, I picked up a pair of Craft Tights that were much like the Sugoi ones they showed us; they have a thin fleece lining for warmth and reflective dots for visibility. As I discovered with the Nike pair I tried on and quickly ruled out, fit is very important–and not all sizes fit the same. Try items on to make sure they work for you and your body shape. Looser pants, such as the Saucony Nomad pant , can also be more comfortable in some ways, but the heat-trapping effect won’t be the same as with tights that seal out air at your ankles. I will say that the very same 5ºF walk found the Craft tights to be not quite enough to keep me from feeling somewhat chilled, but adding a layer over top of them will probably help the next time I go walking in such a ridiculously low temperature. Layering does negate the positive impact of the visibility marking on the tights, but I wear a small light when I walk in the dark–so this shouldn’t be a showstopper for me. Underwear: Wicking underwear is fantastic stuff, and I use ones that I bought from REI. This past Christmas, I bought DH more of the Under Armour boxer briefs that he likes, and he wears those while going on runs in the colder months. Male or female, there’s a wicking underwear out there for you. Use it. DUMP THE COTTON! Depending upon your tolerance for returns, you can buy much of this gear wherever you find items that fit that ideal of synthetic, wicking, and NON-COTTON materials. That said, your local running store, like Marathon Sports, typically has a good selection of items that fit the bill appropriately, and that would ALWAYS be my first recommendation. Mass market sporting goods stores and discount department stores can offer less expensive gear – but the materials may not be of the right quality or fiber, literally. Of course, you can buy online…assuming, again, that you don’t mind the inconvenience of returns if an item doesn’t fit as intended. For shoes, in particular, I strongly recommend going to a running store to get properly fitted. It doesn’t matter that you’re walking; the shoes are the same – just used at a slower speed! Ill-fitting shoes can lead to injury, so get yourself set up properly by making sure your sneakers are right for you. If you have other tips or gear that you want to share with others, please feel free to comment. The community of those who want to be or stay active is large and supportive. Now get out there and get walking! This entry was posted in walking and tagged brooks addiction, cold weather walking, craft tights, exercise, fitness, gear, marathon sports, running store, saucony nomad pant, shoeglove, sugoi tights, under armour boxer briefs, walking, winter walking, yaktrax by crunchymetromom. Bookmark the permalink.